Are you or someone you know an Indigo, Crystal, or a Rainbow Child? I used to think I was all of those all at once, but I have seen through my ignorance. I cannot believe I functioned under the delusion that I was somehow special because I was something as common as an Indigo/Crystal/Rainbow Child. I, too, can be wrong sometimes. It does not happen often but I am strong enough to admit my errors. You know this about me, as I have just revealed it to you. This is not all I'm about to reveal to you. Last night as I was preparing to enter the astral realm and solve your problems with my unique, revolutionary, and disruptive advice column methods and techniques, I stopped. Something felt wrong. I had the compulsion to enter my private meditation octagonal pyramid and meditate instead of entering my silver-lined rose quartz dodecca-hedral travel cave. While I was expertly meditating I received notification from my spirit guide, Morewin, that there is a new and more advanced version of the ape we call the human being. Something better, more special, and powerful than a common Indigo, Crystal, or Rainbow Child. I have named this next version of humanity the "Ultra Violet Adult" and I am happy to inform you that I am one. I am sure I am not the only one, but at the moment I am the only one I know of and that is enough. It is enough both for you and for me. This satisfaction I feel stems from knowing I am at the forefront of evolution, as I have long suspected. This is fantastic news for you, someone who has not even reached the level of Crystal Child. How do I know this? If one can't trust the phantoms and visions that arise from one's mind while meditating in an octagonal pyramid, what can one trust? Exactly. Me. I alone can be trusted both by myself and by you. Do not forget that Nature Herself has entrusted me with heralding the next era of human potential and excellence. At this point I am sure some of you are asking "I have read this far and there is no advice, where is the advice? I am patiently waiting for the advice that will forever alter my fate and fix my life. But I do not see it yet." I will be honest with you. Realizing that I am an Ultraviolet Adult has forced me to step back in awe. I am in the midst of reformatting everything I thought I knew about solving your issues and petty problems. Fixing you one-by-one is tiresome and inefficient, it is what pet psychics do. Instead, I will address the most common problems you are suffering from in the form of an essay which will appear at consistent intervals on this very website. Have trouble falling asleep? I just may find it in my heart to write a piece about "Having Trouble Falling Asleep? Here's What To Do About It." Is your love life still a disaster? Look for my upcoming post about "Why You Are Unlovable and 5 Things You Can Do About It." We will go on like this together until you are healed. As long as it takes is how long I will do it. I know you must be enthralled at the prospect of my being able to mass-heal you through posts and essays instead of Astral visits or common terrestrial mail, but you must wait until next time. This is just the initial announcement. Next month I will unveil the full force of my new "MK Ultraviolet Method For Mass-healing and Cooperative Evolution Method of Techniques For Influence and Engagement." I know the prospect of waiting an entire moon cycle to become whole seems like too much for you to endure. But you have already gone your whole life broken, one more month is not too much. I assure you. You are informed. Next you will be outformed. mind controlmass healing, and the announcing of a mythical opportunity to release your potential. Each of these things could have been stand alone topics, but I have combined them for you. You're welcome. Wait! We are NOT done! There's More! My final bit of news for you this month is I am happy to inform you that I am going to be casting pods into the ether of the internet. That is correct! I, The Rev. Dr. Hugo Holmesnow, will now be the focus of the SEG podcast "Wizard on Whizzin'". Aside from the inadequacy of the so called host, whom I tried to work with, this is an excellent interview. You will hear about my past, present and our future. I urge you to listen repeatedly. No doubt by now you are full. I will leave you to your inner demons. The Rev.Dr. Hugo Holmesnow has traveled the planet in a quest to dilute the wisdom teachings of ancient cultures so they are safe enough for common men and women everywhere to purchase and misuse. Several weeks later he was no longer Hugo Holmesnow, son of incompetent parents. He was and, is The Rev. 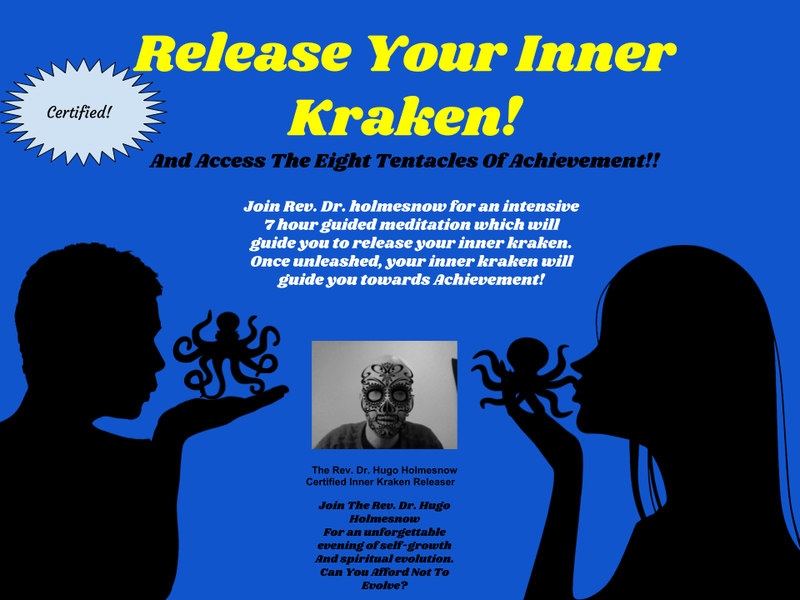 Dr. Holmesnow, certified life coach and inventor of the “Better Than You Superior Life Coaching System”. This system provides proven methods and techniques that are part of an overall method which contains the strategies that you need to excel, advance, achieve, attain, reach and conquer your dreams, goals, fears, hopes and desires.